I know I'm a "little" crazy. But aren't all plant people just a little bit?!? I have a system for keeping track of what plants I have in my garden. 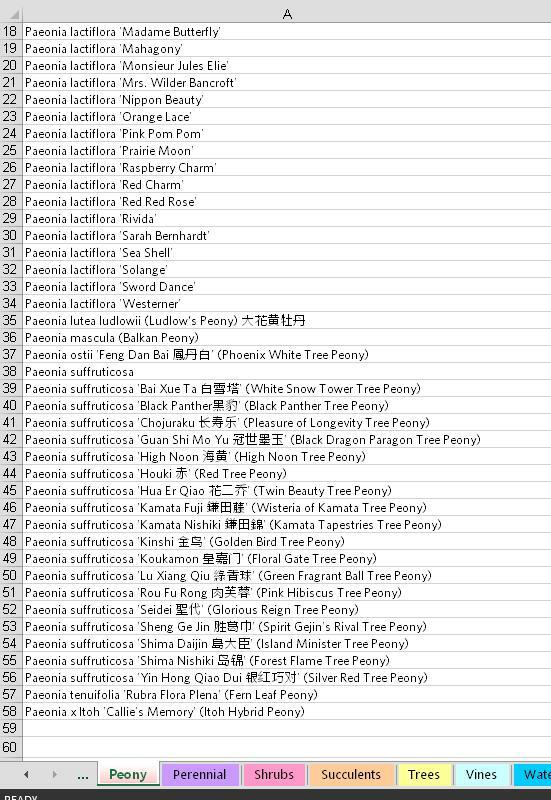 I have an alphabetical name list in a spreadsheet and a corresponding list of descriptions of the plants in a document. I started both lists when I bought my home in 2006. There were barely any plants in the yard at the time, so I was starting with basically a blank slate. What few plants were there, I guessed on or made a generic entry for them. Some might think I have an awful lot of free time on my hands for doing this. It does take some time, but I find that it is really worth it for me in the long run. My spreadsheet list has tabs for my categories (Annuals, Bulbs, Ferns, Grasses, Peony, Perennial, Shrubs, Succulents, Trees, Vines, Water, Tomatoes, Dead Stuff, etc.) and then each individual worksheet has the plant names in alphabetical order. For some of my favorite plants (like Peonies), I also included what I paid for each plant. I can print this list and keep a copy in my car in a 3-ring binder, so when I go shopping, I'm not accidentally buying a plant I already have. I tend towards "collecting", so I try to avoid buying duplicate plants. My memory isn't what it used to be either, so a list is handy. My document file is the same list of all my plants but with a description and photo for each plant. Since Excel isn't the best for word processing, this document is done in Word. When I get a new plant, I pull the tag from the pot and add the plant's scientific and common name, the tag's description, zone, where I bought it, and the year purchased to my list. I include the provenance of my plant too if a friend gives it to me for example. It's not perfect information, but it does give me an idea about the plant's general characteristics and what it will hopefully do in the garden. I take my own photos for the descriptions and since I have been keeping track since 2006, I will often include updated pictures to show how plants have grown over time. It would be WAY too crazy to do for everything. Even my crazy has limits! So I have only done this with the a few of the ornamental trees. If the plant tag's information is insufficient, I just Google the plant name, read a few descriptions, and take an educated guess. 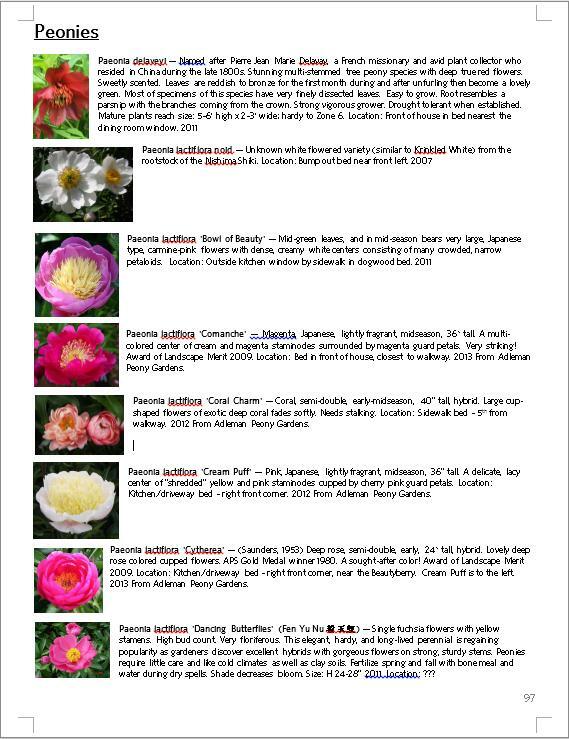 For the Peonies, I have also added a vague description of their actual planted location in the garden, when they are not blooming they all look alike and totally disappear when sleeping. In the winter, I peruse my lists and descriptions. I update what I know has died or been removed for whatever reason. It also reminds me where certain plants are and often I will add a comment how a plant has done over time. Should something ever happen to me that I need to sell my house, at least the future residents will know what's out there and know exactly what they are getting into plant-wise. Last count there were 865 different plants in the yard. I hope they are plant people! I do my best to keep the lists current but even I don't know what some things are anymore. I'm sure there are some things long since dead, but are still on my list. I aspire to this level of OCD, you're my hero. Aww shucks! You've always been mine! Impressive. I remember your list from one of the exchanges. I have a spreadsheet with plant names and descriptions, but a much more willy-nilly system. Also glad to know who I can ask about the Peonies I inherited with the new house. To think I almost took them out. They're so gorgeous. I do love my peonies. I wished they bloomed longer, but for sheer beauty of form and color, they are hard to beat. Impressive, Matthew! I have an old 5x7 card file in which I file plant tags alphabetically. The plan was to affix each tag to a card on which I could make notes. The reality is that plant tags get left on my desk until I can't find the surface anymore and get thrown in great handsfull into the top of the file box. I could use a dose of OCD! Bravo, and I love your new cover photo! We are kindred spirits, I have a couple plant spreadsheets too which are very very useful....but yours goes way beyond my wildest efforts...again, bravo! Yep I use the ziplock method. Throw them in and zip it up. Who knows what I have out there. I say you are one to aspire to for organization. My file box works much the same without the aid of the computer, but you've thought of some things that hadn't occurred to me. This kind of OCD is a source of admiration to most plant nerds, I think. 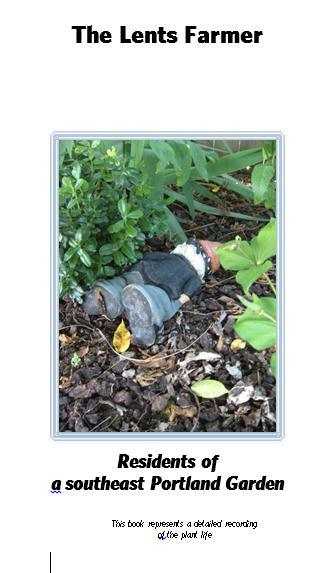 When at your garden open , I remember envying those printed out pages…wonderful ! All I've done is to punch holes in certain tags and put them on key rings , which is handy !